Tivoli Audio launches Model One Digital radio | What Hi-Fi? The Model One Digital is a Bluetooth and wi-fi connected radio that can also play tracks from streaming services including Tidal, Spotify Connect and Deezer. If you can remember the start of the new millennium, you might recall Tivoli Audio's Model One radio. Seventeen years later, the company has brought out an updated version: the Model One Digital. 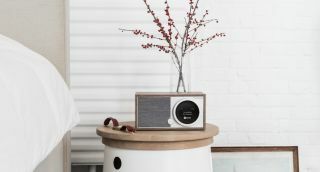 This internet-connected radio features DAB and FM radio, Bluetooth connectivity, as well as wi-fi streaming through its iOS and Android ap. That means you can link to Spotify Connect, Deezer, and Tidal. It also has an in-built multi-room function, so if you own other Tivoli Audio speakers you can connect them to the Model One Digital. You tune the radio using the aluminium dial that sits around its screen, which combines station tuning, track selection, and playback control. The Model One Digital comes in black, white and walnut finishes, and will be available later this month, priced £280.